In October, India got a paltry 44% of the month’s average—the lowest since 1976. An erratic monsoon, such as the one this year, poses extensive challenges for adaptation. Maharashtra, which has declared drought in 42% of its area, is in the throes of a groundwater crisis. Experts have rung warning bells about the possible impacts of the brewing El Niño. A major deficit in the post-monsoon rain, i.e. rain received after September 30, has left parts of the country high and dry. In October, India got a paltry 44% of the month’s average—the lowest since 1976. Despite the relief provided by the northeast monsoon, which arrived on November 1, the country still faces a 50% post-monsoon rain deficit as on November 4. This deficit assumes significance due to the erratic nature of the main monsoon season (from June-September) this year. While the country as a whole received 91% rain during the monsoon, regions like Northeast India, Bihar, Jharkhand, West Rajasthan, Gujarat, Marathwada, Rayalaseema, and North Karnataka all got less than 80% rainfall. Therefore, many states were looking forward to good rains in October and November to avoid drought conditions. However, with 22 states currently experiencing a large deficiency of over 60% in post-monsoon rainfall, this hope is slowly dissipating. Recently, Maharashtra and Odisha declared droughts across 26 and 9 districts respectively. More states might follow suit soon, due to the monsoons’ poor performance. As mentioned before, the overall monsoon rainfall this year was 91% of the long-period (50 years) average. This might seem quite good, but the problem lies in the distribution of rainfall across regions and months. In the northeast region, Manipur and Meghalaya faced deficits of 54% and 41% respectively, while Sikkim received 19% excess rainfall. Also, while the country received 95% of normal rainfall during June and July, during August and September, the rainfall was only 87% of the normal due to the extended dry periods across many regions. An erratic monsoon, such as the one this year, poses extensive challenges for adaptation. The major issue with extended dry periods during the monsoon is the lowered soil moisture content, a crucial factor for a drought declaration. “If the monsoon were normal during this period, the soil moisture would have been adequate for the crops at least until December. The drought-like situation arises if the southwest monsoon rain is deficient”, says Dr G S Bhat from the Centre for Atmospheric and Oceanic Sciences at the Indian Institute of Science (IISc). Even the northeast monsoon, which provides a major boost to post-monsoon rains, has been highly unpredictable in recent years. This year, although the northeast monsoon is expected to bring more-than-normal rainfall, its onset was delayed multiple times until its eventual arrival on November 1. The impact of deficient rain has been felt most keenly in Maharashtra. The state, which has declared drought in 42% of its area, is in the throes of a groundwater crisis. The rainfall deficit during August and September led to heavy exploitation of groundwater in the Vidarbha and Marathwada regions. According to the Groundwater Surveys and Development Agency, a total of 252 out of 353 taluks in Maharashtra reported a drop in the groundwater level, with close to 14,000 villages reporting a depletion of over one meter during 2018 alone. The reported groundwater depletion in Maharashtra is worst since 2015, which was an extensive drought year in India when 11 states including Maharashtra declared a drought. To make matters worse, the post-monsoon rains also seem to be skipping the state. Vidarbha received only 1% of the post-September rain and Marathwada just 12%. The trend paints a worrisome picture for the region, especially for the summer of 2019. Soil moisture reduction due to dry spells during monsoon might become a vicious cycle. As low rainfall reduces the soil moisture content, it, in turn, can impact the monsoon next year. This happens because of a feedback loop where evapotranspiration—water transfer from land through evaporation from soil and transpiration from plants—affects the monsoon patterns. Research says that dry soil can delay the onset of monsoon by up to 11 days. If this monsoon left a bunch of problems in its wake, the next one might not be very different. Experts have rung warning bells about the possible impacts of the brewing El Niño-Southern Oscillation (ENSO) on next year’s monsoon. El Niño is the warmer phase of the ENSO cycle which usually weakens the monsoon due to the warmer oceans in the Pacific. The deficiency of monsoon rainfall during this August and September is also being linked to the evolving El Niño. Meteorologists keeping a close watch on the climate pattern predict a 75-90% chance of El Niño condition during 2018-19. Though it is too early to predict the impact on next year’s monsoon, it is proven that all the severe droughts in India have historically been preceded by strong El Niño conditions over the Pacific. In fact, all droughts in the past century have followed El Niño events (although all El Niño events do not necessarily mean a drought). 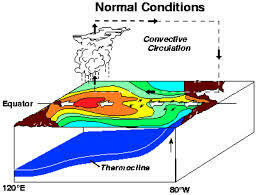 Be it monsoon or El-Niño, most major weather phenomena across the globe are dependent on the heating on land and oceans. The point of concern is that we have altered both land and ocean heating significantly over the past century. The five warmest years on record since 1880 have all been after the year 2010. Even ocean heat content (OHC) recorded this year is the highest since we started measuring it way back in the 1940s. Perhaps it is time to contemplate where we went wrong!